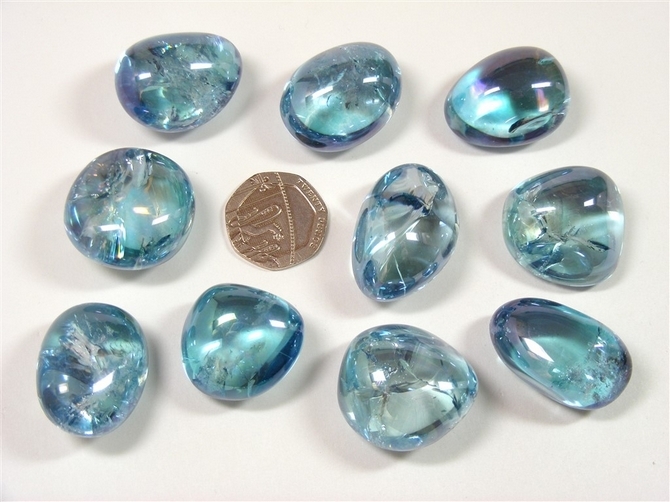 These are absolutely super stones of Aqua Aura Quartz - really lovely ! Each one has been hand picked by Mo and myself and they all have a very intense depth of colour with gorgeous translucency. Unlike some smaller stones you see, these are a good large size too. These are lovely Quartz tumble stones that have been treated with Gold in a process that permanently bonds the precious metal to the Quartz. It will not rub off or wash off. 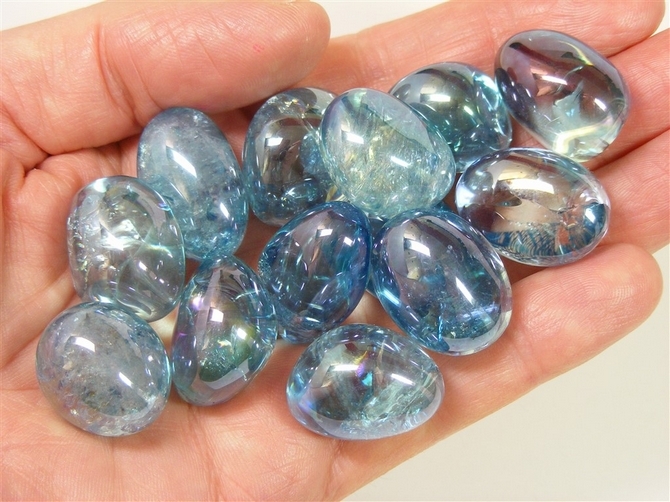 Aqua Aura Quartz is clear Quartz that has been treated with Gold to create its wonderful electric blue sheen. It is said to help with problems of the throat and the thymus gland, with deficiencies of the immune system and with stress-related illnesses. It can also help to cool feverishness. Aqua Aura stimulates our higher and finer levels of thought and enhances our communication abilities. It helps us to become aware of our own motives and why and how we do things. Aqua Aura enables us to clearly communicate our own inner truth. It is a crystal that vibrates at a very high and intense frequency and can induce a very peaceful healing vibration. It soothes angry feelings, and releases stress and negativity. It is said to attract success, wealth and prosperity. Aqua Aura is an excellent crystal for those who want to increase their psychic skills and their levels of awareness. It increases our ability to send and transmit healing energy over long distances. Meditating with Aqua Aura can help us connect to the Angelic realms and can bring to us a more intense level of energy that is useful for both telepathy and for psychic healing. Aqua Aura can soothe and heal our Auric field, facilitate channeling and help us achieve a sense of spiritual elevation. It is also a crystal to protect us from psychic attacks.